My chicken flock is growing in leaps and bounds, creating the need for yet more living space. My previous design for coops was really good, but took months to complete due to only being able to work on them on weekends. This design, borrowed from an online idea and modified to suit my needs, went together in two weekends, and could accommodate four ladies. If you are interested in seeing the construction, please visit my blog post on the build. definately Something to crow about ! I definitely need to get another life!!! Too many chickens!! Nice Les. How much food does 4 chickens eat? I’ve never raised birds before, but it seems like a fun side hobby. Nice Les. How much food does 4 chickens eat? I ve never raised birds before, but it seems like a fun side hobby. If you had told me several years ago I would be raising chickens, I’d have called you crazy. But life has funny ways of turning out. I love these dopey chickens. They all have their own personality. As regards cost, they’re much cheaper (cheeper) than any of my other animals to feed. A bit of chicken feed, some cracked corn, a few dried worms and some herbs like oregano and thyme from the garden. Not much at all really. I’ve spent way more on building their coops than will will ever spend on food in their lifetime! I only have have ten (10) chickens, so the cost is negligible. We have 9 chickens. 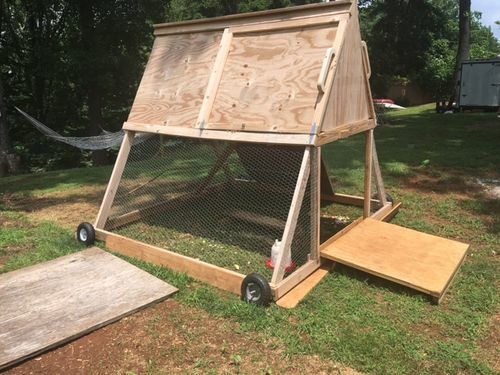 Our Chicken Coop is similar to yours but we put 10 inch wheels on ours and the cross boards make for the hen house support. We are pretty happy with ours. I would make it taller if I were to do it again so that when inside it is more comfortable for my wife and I. We move it around the yard about every two days. We feed them Table scraps (less Meat). Their favorite is macaroni and cheese. Of Course they get Chicken feed as well. They also free range in the yard a couple of hours a day as well. Hi dannmarks, Like you, we have 9 chickens. Some of my other coops have wheels on them. I like your design. we do pretty much the same with our chickens, so we’re on the same page. Thanks for sharing.